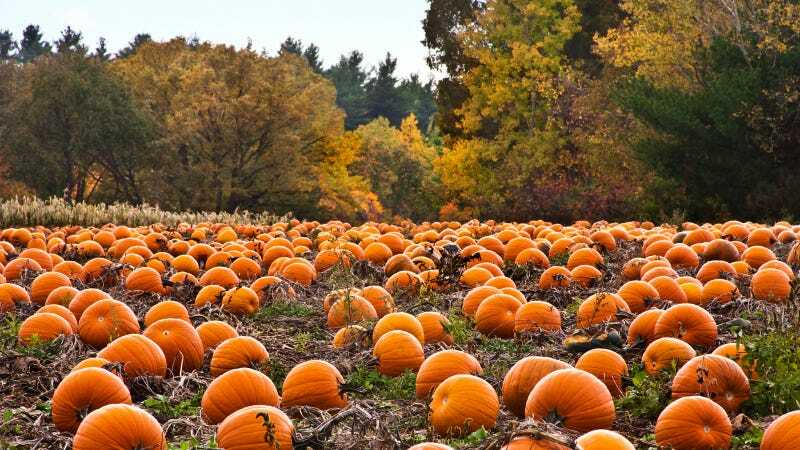 Pumpkins almost went extinct thousands of years ago. Here's how they saved themselves. According to the American Pie Council, pumpkin pie is the second most popular pie in America, something reaffirmed each year on Thanksgiving when it gets consumed in vast quantities. It turns out it was actually a pretty close call that Thanksgiving could have ended up a pumpkin-less affair. If fact, a new study suggests we're even lucky to have pumpkins around at all. In a new paper, Gourds and squashes (Cucurbita spp.) adapted to megafaunal extinction and ecological anachronism through domestication, a group of scientists find that North American pumpkins were nearly ground into extinction, and only survived by adapting to humans' taste for sweet foods. Originally the vast majority of Cucurbita species were tough and bitter, a taste preferred by giant land mammals. "The Holocene (current era) decline of wild Cucurbita was likely driven, at least in part, by the nearly complete disappearance of herbivores ≥1,000 kg, with whom they appear to have had an important symbiotic relationship," the researchers write. Cucurbita ultimately evolved and survived, though, by producing more of the sweeter varieties that humans liked. "Cucurbita species have thrived in the Holocene largely by partnering with humans through domestication as wild populations dwindled and have been bred to lower their natural defenses for human palatability," the researchers say. "Without isolation from wild stands, it is unlikely that Cucurbita could have evolved into a form suitable for human consumption." So now we can enjoy that sweet, sweet pie — mostly thanks to pumpkins' own survival skills.